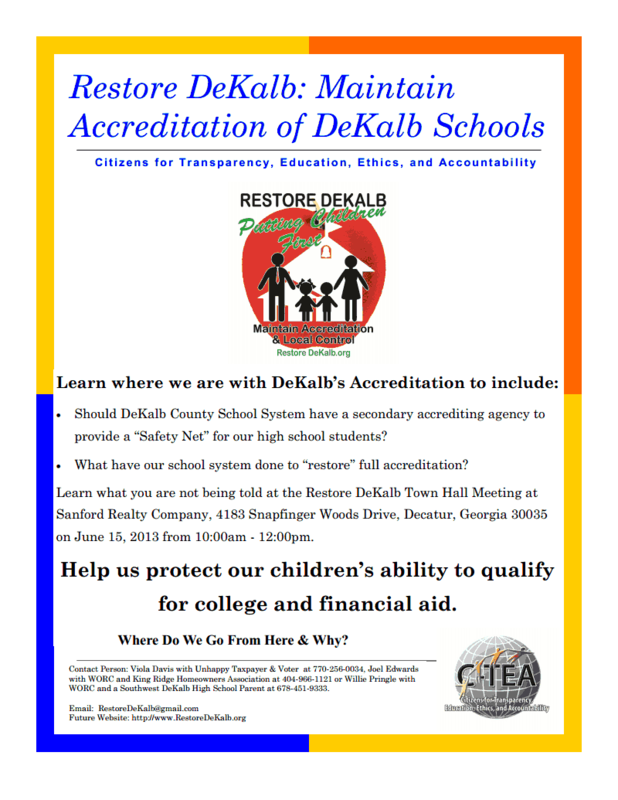 We are Restore DeKalb and have scheduled a town hall meeting for June 15, 2013 at Sanford Realty Company Conference room at 4183 Snapfinger Woods Drive from 10am- 12pm. We are proud to announce that the Georgia Accrediting Commission (GAC) will give a presentation and answer questions from the public concerning a “second or safety net” accreditation. •What have our school system done to “restore” full accreditation? •Should DeKalb County School system have a secondary accrediting agency (Dual Accreditation) to provide a “safety net” for our high school students? •What are the plans to improve graduation rates for DeKalb County schools? •Where does the school district stand on the issue of cell towers on school grounds? We must address the fact that 3505 seniors did not graduate according to the data provided by the Georgia Department of Education. We must address the fact that over 68% of our schools did not rate equal or above the state level. Please read the article published July 7, 2012 by Crossroads Newspaper by Jennifer Ffench Parker and Carla Parker titled, “1,194 Seniors fail to graduate”, that caused a major outrage in DeKalb. We dedicate our town hall meeting to one of our “Foot Soldiers for Justice” – Gregory K. Davis. Please read Crossroads Newspaper article titled, “DeKalb bus mechanic remembered for standing up for co-workers, children. and Restore DeKalb article titled, “Greg Davis – A “Foot Soldier for Justice”.